Stacy Tilton Reviews: Hold it steady and tight! Hold it steady and tight! If you've ever helped someone with a DIY woodworking project you've probably heard them say "hold it steady and tight". I know before my husband got his new vise I heard that a time or two myself. Because well before the Bench Vise came my hands were the vise. I was in charge of holding the piece of wood down on the bench as tight as I could without letting it move so he could saw off the excess. Boy am I thankful we have a bench vise now to do that job. Might sound easy, but you try holding down a piece of wood someone is using a saw back and forth on to cut. Not so easy at all! 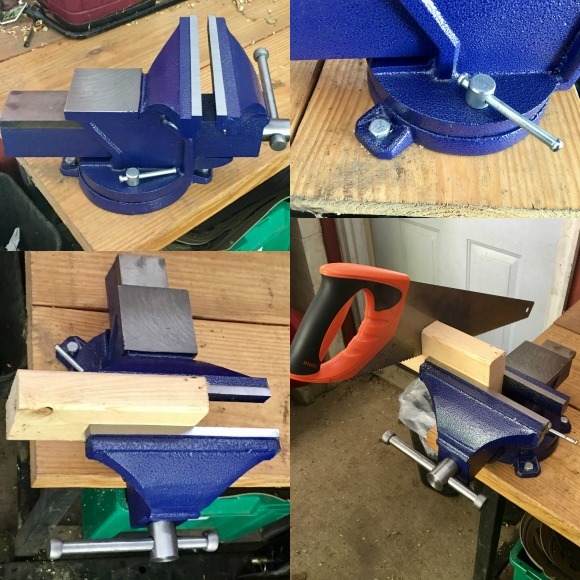 My husband was really excited when I got this Bench Vise for him so he had to put it on his bench like the day it arrived. It only took him about 5-10 minutes to have the vise attached to his workbench using just three bolts so it was a pretty easy process. All he had to do was drill three holes in the bench then ratchet the bolts through the openings on the bottom ring of the vise. It was then firmly attached and wasn't able to be moved. (Unlike my hands that sometimes slipped while holding the wood.) The vise can swivel 360 degrees which I thought was really cool so you can work with it from any angle. Once you have it the direction you want you just tighten it down so it doesn't move while you are using the vise to hold your project. We tested it out with a random piece of lumber and a handsaw just to see how it would hold the wood. Once the lumber was firmly tightened in the vise it didn't move and the vise didn't move at all either as we used the saw on the wood. We were both very impressed with the heavy duty quality of the vise as well as how it performed when being used. I can see it outlasting us both!